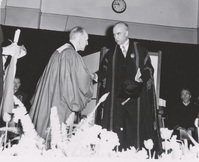 Eminent Chancellor, I present to you His Excellency, The Right Honorable Vincent Massey, P.O., C.H., Governor General of Canada that he nay receive at your hands from this University, deserved recognition of his many and varied services to Canada and the Canadian people. For five years in Washington as Canadian Minister to the United States, His Excellency did much to maintain and promote that friendly relationship so essential to the well being and happiness of both countries. For more than ten years His Excellency served in London as Canada's High Commissioner. His service in London covered the period of World War II, when the duties and responsibilities of this office were tremendously increased. These duties and responsibilities were assumed cheerfully and without regard to personal inconvenience or weariness. Many thousands of Canada's armed forces will not soon forget the kindnesses received from him. His Excellency has always been keenly interested in education and the arts. He has been associated with, and given useful service to the University of Toronto, the National Art Gallery of Canada; the National Gallery of London; the Tate Gallery, London, and to many societies and institutions devoted to the advancement of knowledge and culture. As chairman of the Royal Commission on National Development in the Arts, Letters and Sciences His Excellency with his fellow Commissioners, made an exhaustive study of conditions in Canada in relation to these natters. The report of that Commission will have an effective influence on future development in Canada. His Excellency, the first Canadian to be appointed Governor General of Canada, has filled that office with dignity and grace. For these, and many other reasons which could be enumerated I present to you, Eminent Chancellor, to receive from you the degree of Doctor of Laws, honoris causa, His Excellency, The Right Honorable Vincent Massey, P.O., C.H., Governor General of Canada.